Unsmoked gammon joint formed from selected cuts of cured pork leg with added water. INGREDIENTS: Pork (87%), Water, Salt, Dextrose, Stabilisers (Sodium Triphosphate, Sodium Polyphosphate), Preservative (Sodium Nitrite). Instructions: Oven: 190°C/Fan 170°C/Gas 5 - 30 mins per 500g plus 30 mins Place in roasting tin and cover with foil. Place in the centre of pre-heated oven for recommended time on front of label. 20 minutes before end of cooking remove foil, baste with cooking juices and place back in oven to finish. Remove from oven, cover with foil and rest for 10 minutes. Remove netting, carve and serve. 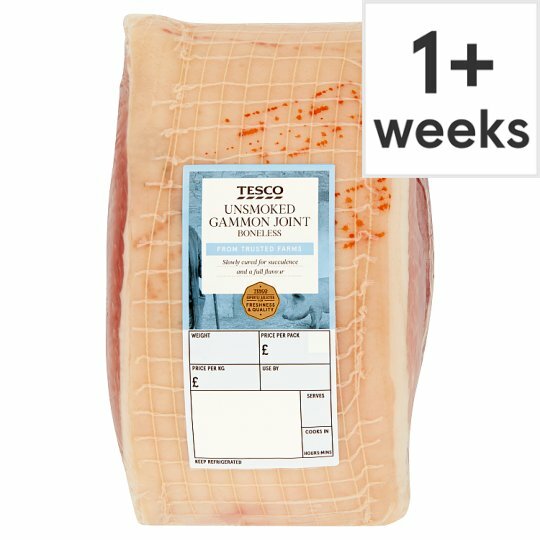 Remove gammon from packaging and rest at room temperature for 10 minutes before cooking.